In May of 2008, I highlighted an article regarding the use of Border Patrol checkpoints at domestic ferry’s off the coast of Washington State. More recently, I’ve highlighted the continued expansion of Border Patrol activities into Washington State with so-called tactical checkpoints along public highways no where near the border along with the ensuing uproar from local residents adversely affected by such police state actions. Thanks to a link in a recent article from Disloyal Opposition, it appears that the Border Patrol’s Blaine Sector leadership responded to a list of questions from the San Juan City Council regarding the domestic ferry checkpoints. Given the close correlation to what the Border Patrol is doing in Washington State and my own experiences with suspicionless checkpoints in Southern Arizona, I wanted to take a closer look at a few of the Border Patrol’s responses to the city council’s questions. Given that one definition of coerce is to dominate or control by exploiting fear or anxiety, it should be clear from the second part of the Border Patrol’s response that this is exactly what they are doing by first admitting you have a right to remain silent but then insinuating that you can be further investigated and/or arrested for actually exercising that right. Over the past year, I’ve been putting this Border Patrol policy to the test. I can assure you, the Border Patrol does indeed use coercive techniques in an attempt to compel responses to their questions. These coercive techniques have included, but are not limited to, extended detention, threats of arrest and most recently collusion with local authorities to maliciously cite me for allegedly impeding traffic while being seized by armed federal agents in front of two temporary stop signs. “9. What can I expect at a checkpoint? You will be greeted by a uniformed Border Patrol agent who may ask basic questions such as: “How are you today?” or “Where are you going?” etc. You will be expected to state your nationality and citizenship and could be asked to provide identification. If the agent is satisfied that there is no suspicion as to your right to be or remain in the United State, he/she will thank you for your cooperation and allow you to proceed. The entire interaction usually takes less than 30 seconds. Additionally, the Customs and Border Protection Field Manual indicates reasonable suspicion is needed in order to detain. While not in compliance with Supreme Court jurisprudence on the matter, reasonable suspicion still rises head and shoulders above the ‘mere suspicion’ threshold referred to in this response. An agent can make a visual inspection of a vehicle insofar as what is ordinarily visible from outside the vehicle. If they see something that constitutes a clear and present danger to themselves or others, they may act immediately and without a warrant to protect themselves or others. Agents can also do a “walkaround” with a canine without a warrant to protect themselves or others. However, they may not search a vehicle without probable cause, consent or a warrant. The same rules apply, in general, to individuals in the vehicle, including the officer safety provisions. Additionally, the agent can require persons to exit the vehicle for safety purposes. Agents will also frequently make use of portable radiation detection equipment – it’s entirely passive and unnoticeable unless activated. While this statement may be true if agents have probable cause to believe a crime has been committed, it’s not true for the vast majority of cases where Border Patrol agents demand individuals exit their vehicle. Given this background information and the Border Patrol’s formal response to these questions, it should be clear that agents routinely exceed the scope of anything the U.S. Supreme Court authorized in U.S. v. Martinez-Fuerte. As such, the manner in which such checkpoints are routinely conducted is patently unreasonable and shouldn’t be suffered by a free people. The Office of Border Patrol (OBP) is one of three enforcement components of the Department of Homeland Security’s (DHS) Bureau of Customs and Border Protection (CBP). The Border Patrol is responsible for securing our nation’s borders between, or otherwise away from, the lawful ports of entry. Another CBP component, the Office of Field Operations (OFO), secures the borders at those ports of entry. CBP Air and Marine Operations supports both OBP and OFO in those specialized environments. The Immigration Act of March 3, 1891 represented the United States’ first truly comprehensive immigration legislation. Among its significant provisions, it established the Bureau of Immigration under the Treasury Department and allowed for the creation of rules governing the inspection of persons arriving in the United States from contiguous countries. The subsequent 33 years saw the passage of a panoply of legislation establishing increasingly restrictive immigration controls. This culminated in the passage of the Immigration Act of May 24, 1924. This litany of legislation was accompanied by a corollary increase in the numbers of prospective immigrants circumventing the prescribed processes for admission into the United States – illegal immigration burgeoned dramatically. 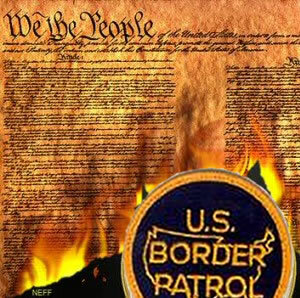 Border Patrol agents’ authority is derived from §235 and §287 of the Immigration and Nationality Act (INA) of June 27, 1952, as codified in Title 8, United States Code (USC), §1225 and §1357. respectively. Additionally, the Commissioner of Customs and Border protection has embued Border Patrol agents with Customs enforcement authority pursuant to 19 USC §140(i). This discussion will focus on the subsections that are most relevant to ferry operations. First, let’s examine why a discussion of ferry terminal operations would include the term “checkpoint,” given that the expected association would be with a place where cars and trucks are inspected. Ferries operating on waterways are the functional equivalents of buses operating on paved highways. They are treated identically for checkpoint purposes. Near the southwestern border, buses routinely stop for inspection at Border Patrol highway checkpoints – ferries are subject to the same scrutiny under the same seat of procedures and legal parameters. Therefore, we will use the word “checkpoint” in referring to ferry operations, as this is what they effectively are. In examining checkpoints, it is important to distinguish them from “roving patrol stops.” A roving patrol stop is one in which agents on patrol select a specific vehicle – automobiles, trucks, buses, boats, even aircraft – from all others then on the road, in the water, or in the air to be stopped for further examination. The courts have long held that such stops must be prefaced on “…specific articulable facts, together with rational inferences from those facts, that reasonably warrant suspicion that the vehicles contain aliens, who may be illegally in the country.” This “reasonable suspicion” standard falls short of probable cause, but is nevertheless a standard that clearly prohibits arbitrary or capricious stops. Checkpoints require all traffic to stop, and, as such, are not subject to selectivity on the part of the agent(s) as are roving stops. There is no explicit statutory authority to conduct checkpoint operations. This authority has evolved consequent to numerous court decisions weighing these tactics with Fourth Amendment considerations. Additionally, the courts have held that “reasonable suspicion” is not required at temporary (tactical) checkpoints, as long as the checkpoint is recognizable as such, has clear traffic revisions, is appropriately lighted and is sufficiently visible as to allow approaching motorists to see that other vehicles are being stopped and that Border Patrol agents are operating the checkpoint. We must also consider that the area geography and resource limitations make it unreasonable to believe that all illegal entry attempts are stopped at the actual land or marine border. The solution to this is “defense-in-depth.” The ferry terminal is a second tier in that enforcement posture. The Border Patrol mission is focused on security at and near the border. Checkpoint operations support that mission. Roving patrols of urban areas, worksite enforcement and identification or apprehension of domiciled aliens are not part of that mission – those activities are the province of Immigration and Customs Enforcement (ICE). Thus, checkpoints are exactly that and nothing more. No. But you should always have some sort of verifiable photo identification. Certainly, if you are driving, you should have a valid driver’s license with you. If you are a lawful immigrant 18 years of age or older, the law requires you to carry evidence of alien registration at all times. Failure to do so can result in a fine or your being arrested. 11. Am I required to answer the agent’s questions at the checkpoint? No person can be required to give evidence that incriminates themselves – that is a constitutional right. Neither can any public official compel or coerce such a statement if the person being questioned refuses to give one voluntarily. However, the law is quite clear that agents can interrogate any person who is an alien or who the agent believes to be an alien as to his right to be or remain in the United States. A refusal to answer could be construed as an articulabel fact supporting a level of suspicion to further investigate and possibly to arrest, depending on the totality of the circumstances at hand. 14. What if I don’t want to stop at the checkpoint? Fleeing a checkpoint is a felony. 18 USC §758 states: “Whoever flees or evades a checkpoint operated by the Immigration and Naturalization Service, or any Federal law enforcement agency, in a motor vehicle and flees Federal, State, of local law enforcement agents in excess of the legal speed limit shall be fined under this title, imprisoned not more than five years, or both.” State and/or local officials may also file additional charges at their discretion with respect to offenses committeed while fleeing the checkpoint.